I’m continuing my artist-in-residence at a local school, helping a Grade 5/6 class create heroic characters through drawing, writing, and prop building. In week 2, we began the process of building props for the characters and designing costumes. The students really embraced this project. When I came in for my third week, I saw all sorts of wonderful designs. One student even used an old doll to make a mannequin for her character’s costume. Another student brought in a model car and sunglasses that he will use as part of his display for his hot-rodding character (he added a few of the character’s tools in the trunk). You can see other examples of the students’ brainstorming in the photos below, including interesting key props and some character designs. In Workshop 3, I taught the students some illustration techniques to help them with their drawings. Their task is to create a model sheet showcasing different expressions of their characters and to also draw their heroes in one key pose. This has proved to be a challenging part of the project, mostly because of the patience involved. I’ll have to continue working with them next week on this illustration part of the project. A portal passport to adventure! I thought I would post more illustrations from my project for the BC Library’s Summer Reading Club. 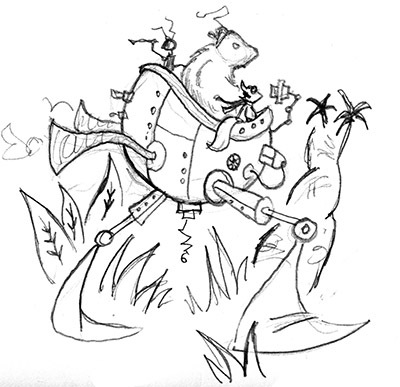 The theme is “Book a Trip” and the library team and I came up with the concept of a “portal passport” that can transform into various vehicles that will carry our crew of critters on adventures around the world—and beyond it. All of these pieces will be included in the overall poster design and some of the other marketing material for the library’s campaign. Slowly but surely, everything’s coming together . . .
I’m currently working as an artist-in-residence at a local school, helping a Grade 5/6 class create heroic characters. In the first week, we started by brainstorming. In the second workshop, we really cranked up the fun factor, tackling our characters from the perspective of costumes and props. The other fun part of this class was costume design. I brought in a kit of fabric swatches, buttons, and hair samples and the students have collected samples to go along side the character profiles they are developing. The students had a lot of fun picking out the exact hair color of their characters and the different textures for their clothing. This gave them a different way to visualize their characters and helped enrich their understanding of them, too. Here’s some of the photos from all the marvelous mayhem . . .
For the next workshop, we will be concentrating on illustration tips and techniques. One of the projects I’m working on this fall is an artist-in-residency at a local elementary school. This is a neat five-week project in which I work with a single classroom of Grade 5 and 6 students to develop and design heroic characters. Our end project is to create a detailed display that will show the different aspects of the character, including a written profile, a detailed illustration, a pose and expression model sheet, and some three-dimensional props. For the first session, I introduced the topic by discussing famous characters from literature and film and showing some of the common traits and themes we find in those characters’ journeys. 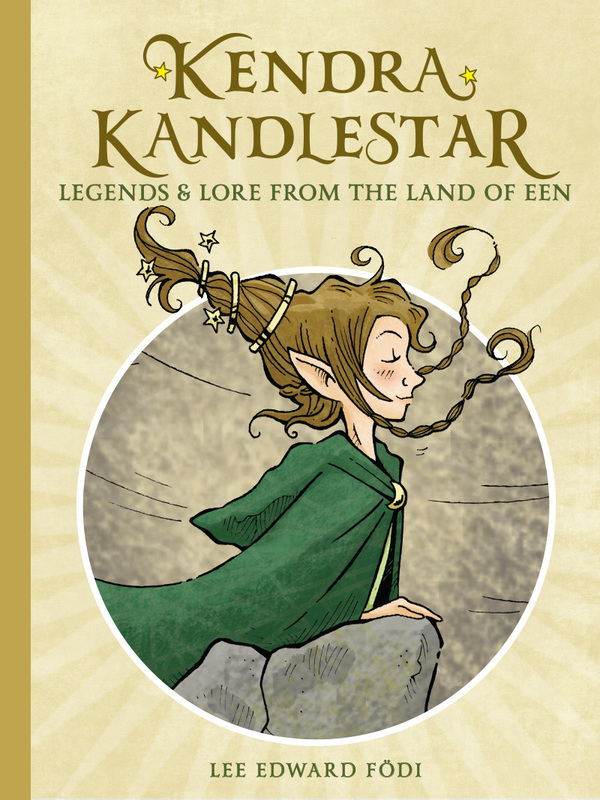 I also showed the students how I came to develop some of my own heroic characters, not only in my Kendra Kandlestar series, but for a new book I’m working on. I brought in a stack of my brainstorming journals and the students were able to flip through and discover some of my different character-building pages. We’ve actually already completed the second workshop, in which we attacked our character design from a tactile perspective, building props and imagining costumes. But I will talk about in a separate post—I’ve been so busy, I’m playing catch up! 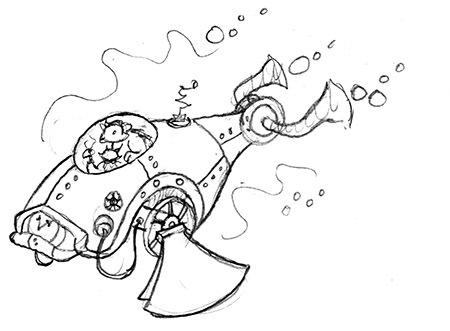 As you can see, I was toying with the idea of a vertical design and a steampunk frame. 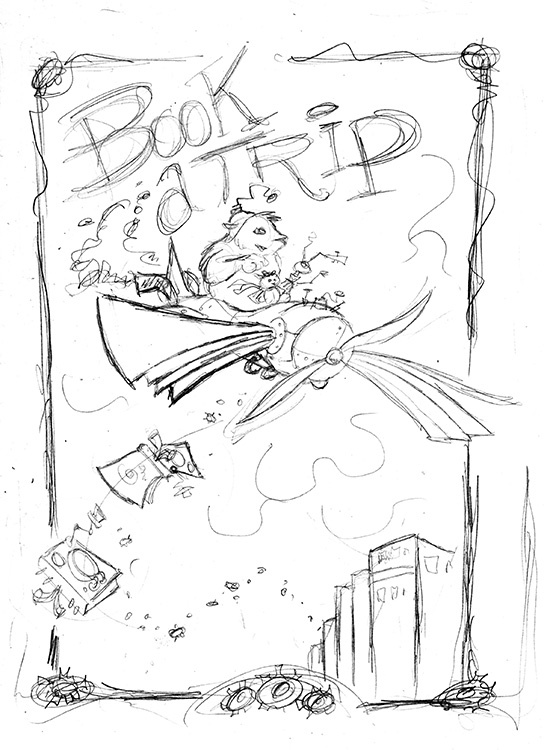 I liked the idea of the book transforming into a plane, and that seems to be the part everyone on the library team has been agreeing on. No gears! I decided to make the poster horizontal, to stretch out process of transformation from the portal passport into the plane. The library team asked for one additional stage of transformation between the book and the plane; initially, I wasn’t sure if that could be fit in, but I think it does work quite nicely. Now I’m hard at work inking and colourizing the individual components. It’s all coming together, slowly but surely. Which is good—I have less than three weeks to complete!